This print showing a view of one of New York City's more notorious poor neighborhoods offers a variety of picturesque and sensational incidents, including an assault in broad daylight. It also indicates that African Americans worked and resided in a district usually identified as composed largely of Irish immigrants. Source | D. T. Valentine, comp., "The Five Points in 1859," Manual of the Corporation of the City of New York for 1860 (McSpedon & Baker: New York, 1860), 397. 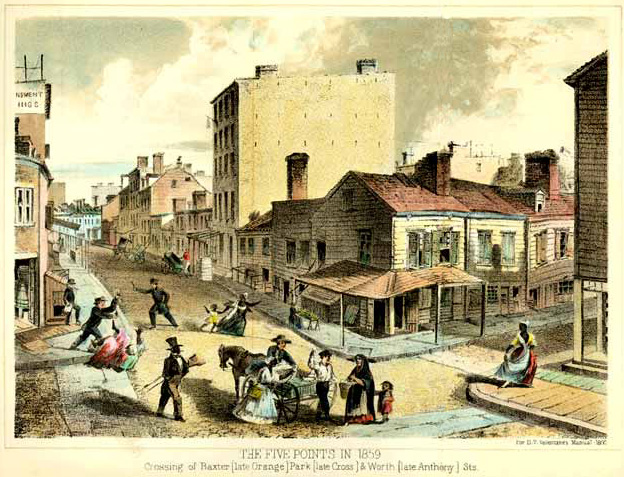 Cite This document | Unknown, “Five Points in 1859,” HERB: Resources for Teachers, accessed April 20, 2019, https://herb.ashp.cuny.edu/items/show/1681.